(CNN) -- Who would open one of the world's biggest casinos in the depths of a global recession? 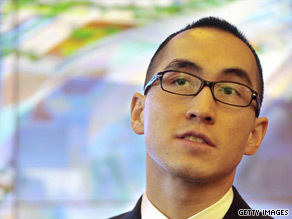 Big city dreams: Lawrence Ho's business portfolio in Hong Kong and Macau is growing. Answer: Lawrence Ho, the scion of a casino business mogul who has clearly inherited his father's love of a calculated risk. Ho's father Stanley is a man synonymous with the creation of Macau as the world's biggest gambling destination. "Over the past 40 years he has put his thumbprints all over Macau. I think if you look at the major infrastructure projects, whether it's the airport, the ferry terminals, he was involved in building up a lot of those," Lawrence Ho told CNN. But in opening City of Dreams in Macau earlier this year, Ho is trying to carve his own niche and continue to build up his own business empire. "I think gone are the days when you can open a property and 'Bang!' you would steal significant market share from others," he told CNN. "Before we opened we were, like the rest of the world, a little bit wary of the timing, but I think in hindsight the world economies are doing a lot better and Macau has seen its first year-on-year increase in July and August was a booming month. So I think all in all we couldn't be happier." Ho's company, Melco-Crown Entertainment, is independent from his father's huge portfolio of businesses and the multibillion dollar City of Dreams project is a partnership with Australian James Packer, himself the son of a media tycoon. Ho is respectful of his ailing father's achievements and the advantages that the family name has given him, but also the desire it fostered to forge his own success. "The bigger the shadow the more we can feel the underdog syndrome. ... being his son opened many doors, but at the same time I grew up in a very big family with our own issues, but all in all certainly being his son has helped a great deal," he said. There are no worries about interference from the mainland -- "I suspect that China definitely wants [Macau and Hong Kong] to do well" -- and Ho remains positive that Asia will see the quickest recovery from the downturn. "A lot of the Asian countries and economies have handled the [economic] crisis this time a lot better than the Asian financial crisis 10 years ago," he said. "So I think, all in all, Asia has managed to come out of this much quicker than the rest of the world. And really when people are feeling better they travel and they spend more, and you know we are in the business of providing leisure and entertainment."